Tea truly is a beverage for all occasions. From regular morning ritual to post-meal digestif, the versatility of our favorite little leaf is definitely one of its finer qualities. For me, tea is tailor-made for two things: social gatherings and mindfulness/meditation. I’ve talked a bit about tea as a social lubricant in a previous post and I’ll be discussing it more soon, so I won’t go into it here. 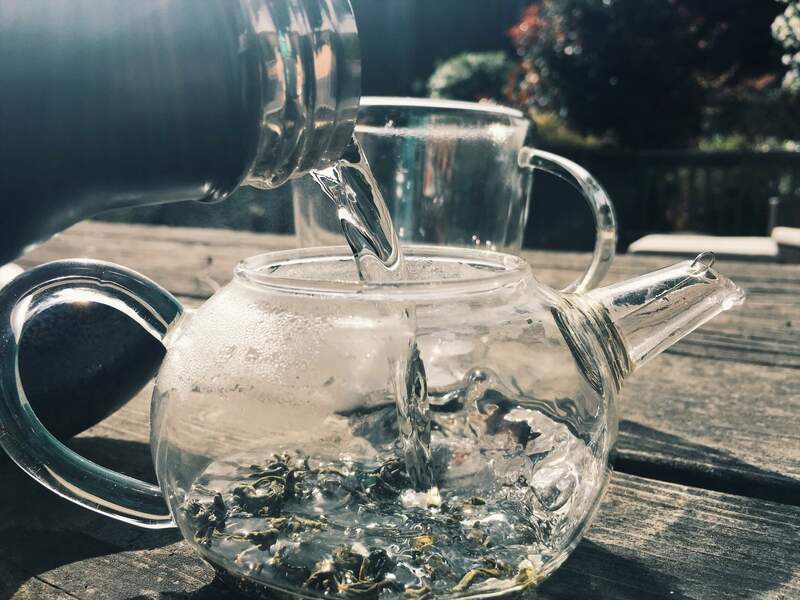 What I’m really interested in discussing in this post is how drinking tea provides the perfect opportunity to practice mindfulness and meditation. In my mind, the ability to arrive precisely when you mean to requires neither rushing nor dallying. It also means accepting that you arrive exactly when you are meant to, so any attempts to hurry or delay are ultimately pointless. You’ll get there when you’re supposed to. Tea provides the perfect opportunity for this kind of purposeful contemplation and mindfulness. It’s an incredibly complex substance with a difficult path from tree to teacup while also being nothing more or less than a leaf in a cup of hot water. It is at once a gift from nature and the result of thousands of years of human ingenuity. So many small details combine to create the experience you have with your tea! The process of brewing and enjoying a simple cup of tea is ripe with sights, sounds, and sensations to enjoy before a drop of tea ever touches your lips. From choice of teaware, to the tea itself, and on through boiling and brewing, the tea experience is one of the best ways I’ve discovered to get out of your head and into your body. Note: You don’t have to brew your tea in the Chinese gongfu style to make it a meaningful and mindful experience. That said, I happen to think it’s best to brew gongfu for tea and mindfulness, as well as a whole host of other reasons. Now let’s get into some ways to be more mindful about making your tea. Location. You don’t have to brew under a waterfall or in the deep Redwood forests. Just sit somewhere comfortable, ideally with some good natural light to help you appreciate everything you’re seeing. Teaware. If you’ve got a collection, find some pieces that best suit your mood (or desired mood). If you’ve got one gaiwan and one cup, that’ll be great, too. I love brewing with my first-ever porcelain gaiwan because it feels like hanging out with an old friend. Tea. Follow your mood! I usually think of certain flavors or feelings I’m looking for. A robust black or ripe puer might be the choice on a gray winter day. Maybe it’s a green tea to remind me of spring. Or maybe I just want to have a certain tea. It’s not rocket science. It’s tea! Water. Get your water going in a kettle that is ideally within arm’s reach. I dislike getting up and down constantly for water when I’m drinking tea. It breaks the flow and takes me out of the moment. If it can’t be avoided, you can still try to keep your mindful groove going even while you go to fetch some water. With everything ready to rock, it’s time to brew! I love the sound of tea leaves moving from package into my cup or tea boat. It changes depending on the type of tea and teaware I’m using. I love the sight of dry leaves on display. Looking at your dry leaf can teach you a lot about how the tea was made. Listening to the water hiss and bubble gets me excited to start brewing. The sound of lids scraping on cups and teapots, cups moving on trays, of pouring water from kettle to vessel, these are a symphony of sounds to savor. There’s something fun about looking at a lidded gaiwan or a covered teapot while the tea brews. Something incredible waiting inside for me. I simply need to wait until the proper moment to enjoy it at its best. How am I moving? I think about my arm raising and lifting my hand to grasp my brewing vessel. I look at my hand as I pickup and pour the tea. The human hand is pretty cool on its own! I always lift the lid off the wet leaves after I’ve poured the tea and smell the aroma in the lid. I also smell the wet leaf. These aromas are frequently different from the taste of the tea liquor in the cup, so savor them! There are many other opportunities to enjoy small details that surface in the process of brewing. Don’t try to notice all of them. Be where you are, feel what you feel, and see what you see. Maybe the scenery matters one day but the teapot matters more the next. Don’t judge your experience. Of course, we must also taste the tea! We’ve worked hard enough to get to this point, after all. When I launched this blog one of my first posts was about what I call “thoughtful drinking”. Looking back on it now, it feels immature. After a little over a year of time and substantially more experience drinking tea, there are a few important modifications and additions I’d make to the post. Having a flavor vocabulary and a matching ability to identify flavor notes in tea is not nearly as important as I’d originally thought. It’s fun to use the same language wine drinkers use to describe taste, but ultimately it can get in the way. Drinking a tea is as much about what’s happening in your body as what’s happening in your mouth. I find some teas impart an incredible body feel, and in fact some teas are sought after for specifically that reason. Don’t ignore any of your senses when you drink tea. Don’t be overly concerned with the mechanics of tasting. Don’t try to do or be anything when you’re drinking tea. Just drink it. Taste it as it is. Experience it as it is. The brain is an exceptional tool for pattern matching and it will try to do just that if you let it. Ignore it. You’re having an experience, not thinking about it. The best thing about drinking tea, even if it’s one you’ve had repeatedly over time, is there’s always something new or different to enjoy every time. The Japanese practice of Zen Buddhism calls this ichi go ichi e (一期一会). It means “one time one meeting”. You will only be in this time and place the way you are at this one moment in time. It can never be reproduced exactly. Therefor, you’re having a once-in-a-lifetime experience. Enjoy it. Explore it. The art of tea is in its variability. True mindfulness consists of understanding that at every opportunity. With so much variety to taste and enjoy, it’s no wonder tea is as wonderful as it is. Now get out there and find that special place for yourself!